Astronauts aboard the International Space Station are authoritatively the foremost humans in narration to ever eat space-grown lettuce. Japanese astronaut Kimiya Yui, NASA's Kjell Lindgren and Scott Kelly of the journey 44 crew nibbled on red sprigs of romaine lettuce making this the first time anybody has eaten food cultivated in space. Astronaut Kelly feels it tasted fine and a bit like arugula. Certainly, trial tasting space crops was only the first step. The Expedition 44 crew members also froze half of the lettuce yield, which the team will send back to Earth for scientific examination. While it may sound eccentric for lettuce to taste something like lettuce, these luxuriant greens were grown in a very dissimilar atmosphere than here on Earth. 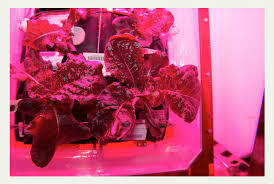 The lettuce developed a deep red color because of being mainly grown in an atmosphere lit by red and blue LEDs. Also thanks to the lightness of space, the lettuce didn't not cultivate in a conventional plot of soil. Instead, NASA seeded a rooting "pillow," which contains the essential nutrients and mud for the plants to obtain root and completely grow in 33 days.